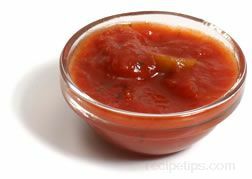 An Italian sauce that is very spicy and strong flavored. Traditionally made with garlic, bits of dried chile peppers, capers, and anchovies as key ingredients, this sauce can be mild or well seasoned depending on the type and amount of spices added. There are a variety of pasta and fish dishes using this sauce to enhance the flavor of the dish, such as Pasta Puttanesca, Spaghetti Puttanesca, Linguine Puttanesca, and Shrimp Puttanesca.